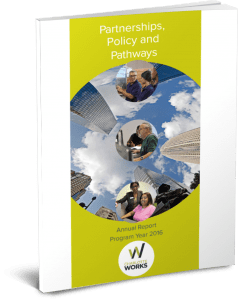 Program Year 2016-17 (PY16) has been a transformative one for Charlotte Works and our partners thanks to leadership from our Board of Directors and staff. With a new mission that aligns our partnerships, policies and career pathway models for a more effective workforce system, we’ve created collaborations that have increased the impacts for businesses, working adults and youth in Mecklenburg County and the Charlotte region. We’re proud of these impacts and our status as a nationally recognized workforce board. The successes of this past year are due to greater alignment of our partners. As a convener of our local workforce system, we’ve established direct-service relationships with several community organizations to ensure more impactful results for the adults and youth we serve. Charlotte Works served 31,708 career-seekers and placed 7,065 workers in jobs. We placed 7,065 adult and dislocated workers into employment, with salaries totaling more than $103 million. For every dollar we invested, $30.68 was put back into the community in salaries. Career Centers provided career services to 31,708 career-seekers. We provided scholarships to 270 career-seekers. They were trained in high-growth industries including health care, finance, information technology and transportation. Our Career Centers served 1,293 local employers. Services included connecting employers to career-seekers, hosting job fairs, candidate screening services and providing labor market information. NextGen providers (ResCare Workforce Services, MeckEd and CPCC) served 571 youth and young adults. Less than 10% of our funding is used for administration. The other 90% directly benefits our diverse population of clients. Want to learn more about how we’re advancing an integrated and highly skilled workforce and contributing to the Charlotte region’s economic development? Feel free to download our latest annual reports!